Reference: ‘The 2007 Holmes Report Global 250’, PRWorld, August 2008 . For the past fifteen years the disparate international tribes of ad men and PR consultants have been quietly consolidating their power by forging giant conglomerates. The two biggest of these, WPP and Omnicom, were founded within a year of each other in the middle 1980s. Together they now manage the hearts and minds of global populations for their transnational corporate clients. The rationale behind the amalgamation of advertising and PR companies is simple: the merging spree of transnational corporations in the 1980s and 1990s produced giant companies with far flung assets and interests. These vastly enlarged corporate entities demanded one-stop advertising and PR services. To provide this one-stop service financial whiz kids moved into the communications business and began the amalgamation process. The WPP Group is now one of the top three communication service providers in every market of the world.Clients of the WPP Group have included the majority of companies in the Fortune Global 500 and the Nasdaq 100 including Ford, IBM, Kellogg, Eastman Kodak and American Express. The reported revenues for WPP in 2011 were £10 billion. It has 158,000 employees in 2500 offices in 107 countries. In 2000 WPP founder and CEO, Martin Sorrell, said of his vast empire (then worth around $14.5 billion): "We share a common philosophy and culture of providing clients with integrated solutions to their marketing needs". Indeed, the diverse group is able to offer clients every conceivable service associated with marketing their products and promoting their corporate goals. The WPP Group consists of around 321 companies including some of the world’s largest firms in the areas of advertising – J. Walter Thompson, Ogilvy and Mather, Young & Rubicam – branding and identity; demographic marketing; direction, promotion and relationship marketing; investor relations; pubic relations; strategic marketing consulting; and media investment and services. In the field of pubic relations the WPP Group not only owns the two of the largest PR firms worldwide – Burson-Marsteller and Hill and Knowlton – but they can also draw on the skills of Ogilvy Pubic Relations Worldwide, Cohn & Wolfe and several others. The WPP tribal conglomerate began from very humble beginnings in 1985. Using borrowed money he acquired many companies. In a hostile takeover in 1987, WPP acquired the much larger US-based J. Walter Thompson Group, which included Hill and Knowlton, for $566 million. This was only one of nine major acquisitions WPP made that year. A couple of years later it acquired the Ogilvy Group for $864 million prompting Time Magazine to describe Sorrell as the "Machiavelli on Madison Avenue" and "the most feared raider to set foot on Madison Avenue". In 1990 Advertising Age named WPP the top advertising agency in the world. And whilst WPP was acquiring companies as fast as the banks would allow, its subsidiary companies were also making their own acquisitions. WPP’s 1999 annual report notes "We continue to trawl carefully for acquisitions and investment opportunities…"
At the same time WPP expanded the reach of the companies and networks it had already purchased. According to its annual report: "In 1999 the Group increased its equity interests in advertising and media investment management agencies in Australia, Austria, Brazil, France, Italy, the Netherlands, Portugal, Spain, Sweden, the UK and the US; in information and consultancy in Argentina, France, Germany, Mexico, Poland, the UK and the US, in public relations and public affairs in Chile, Germany, the UK and the US, and in branding and identity, healthcare and specialist communications in Brazil, the Czech Republic, France, Germany, the UK and the US." WPP is more than just a holding company. It’s stated goal is to be "the preferred provider of multinational marketing services", able to provide clients with a comprehensive and integrated range of services that are both tactical and strategic. 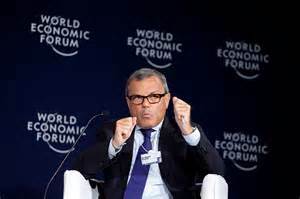 Sorrell told Forbes Magazine in 1999: "It is politically incorrect to say so, but our big clients are becoming more coordinated". That is the reason, he claimed, that providers of communication services must also be coordinated and centralised. One of WPP’s strategies is to form internal networks of its companies to offer specialist services. For example, CommonHealth combines all the WPP companies with expertise in healthcare communications to make an organisation that WPP claims is "the largest healthcare communications resource in the world". Its services range through "advertising, consumer promotion, public relations, medical education, and the latest interactive technologies". Its established clients include Pharmacia & Upjohn, Procter and Gamble and Astra Zeneca. So what is the significance of this concentration of ownership in the communication services industry? Is it, as the Guardian newspaper suggests, simply that the advertising and PR industries are catching up with the consolidation binge of transnational corporations? "Having lagged behind the companies they serve for more than a decade, ad agencies … rushed to buy, or be bought, in an often bewilderingly rapid feeding frenzy." Does it matter that four of the world’s largest public relations firms are now owned by the same corporation? Is WPP just a holding company formed to make money? Or does it have more colourful possibilities? Could it be a potential power house, a huge propaganda machine, with the reach and coordinated skills in people manipulation that might allow it to rule the hearts and minds of the entire global population? Some ad men and PR flacks have long dreamed of such a tool. Even back in the early 1980’s, when J. Walter Thomson was small fry compared to its WPP parent today, one of its executives went on record musing: "We have within our hands the greatest aggregate means of mass education and persuasion the world has ever seen – namely, the channels of advertising communication … We have power. Why do we not use it?" WPP is a UK-based company. This means that when Hill and Knowlton masterminded the Kuwaiti campaign to sell the Gulf War to the American public the owners of this highly effective propaganda machine were residing in another country. Should this give some pause for thought? Does it demonstrate a certain potential for the future exercise of global political power. It goes without saying that the power to manipulate democratic political processes through managing public opinion, which Hill and Knowlton demonstrated years ago, is trifling compared to the potential power now residing in integrated conglomerates like WPP and Omnicom. Sorrell himself, is a somewhat enigmatic figure. He is reported to have a grandness of vision that isn’t reflected in either his diminutive stature or his modest self-appraisal: "he once famously described himself as ‘a dull, boring little clerk’". (But this was before he received a knighthood last year and became Sir Martin). The chairman of the WPP Board is perhaps more familiar. Remember Hamish Maxwell? He was the chairman and CEO of Philip Morris from 1978 to 1991. During the heady 1980s, when tobacco money was busy with corporate takeovers, Maxwell played a leading role. He oversaw Philip Morris’s acquisitions of General Foods, Kraft and several other major consumer goods firms. 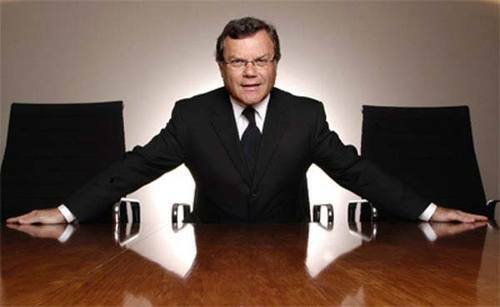 Maxwell has been chairman of WPP since 1996.